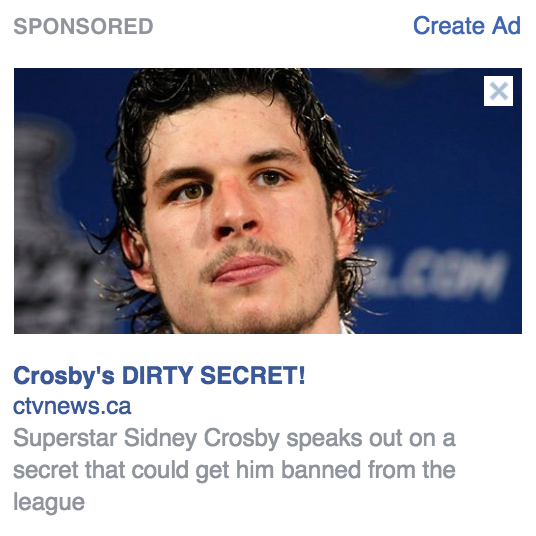 Sid the Kid Facebook advertisement. Now I can already see you rolling your eyes. It does look a bit scammy doesn’t it? The problem is that I looked at the domain of the advertisement and saw ctvnews.ca which is a reputable news organization in Canada. 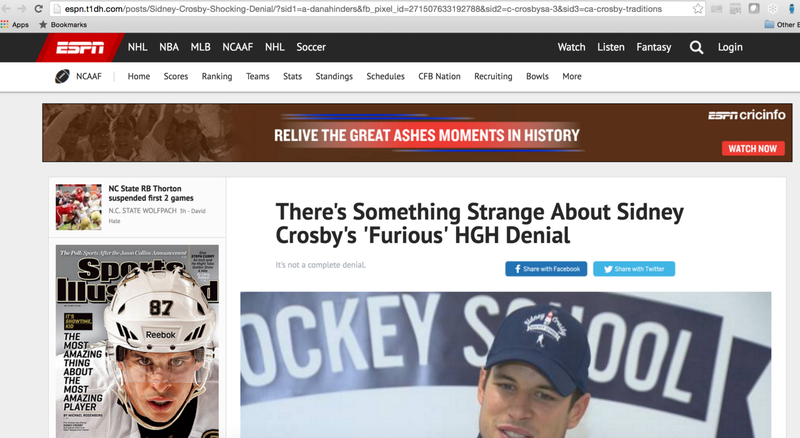 This of course made me think that something actually was up with Sid. So I clicked. Yep. I surely did. So you will notice that this looks an awful lot like ESPN, not like CTV News at all. Not only that but the domain espn.l1dh.com does not exactly leave me feeling confident that I have landed on ESPN’s site either. 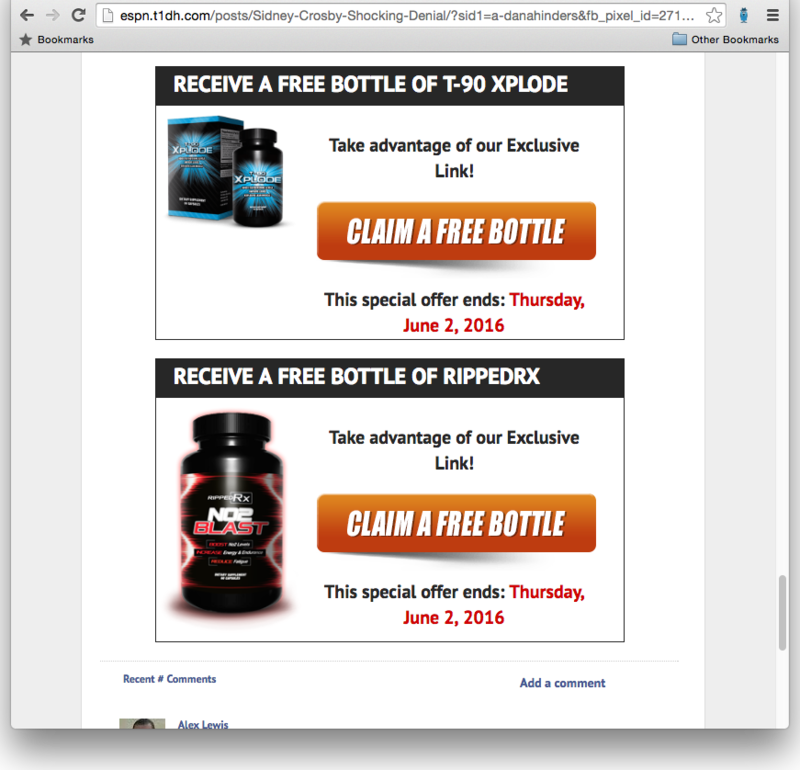 Scrolling further down the page we see the inevitable advertisements for supplements. 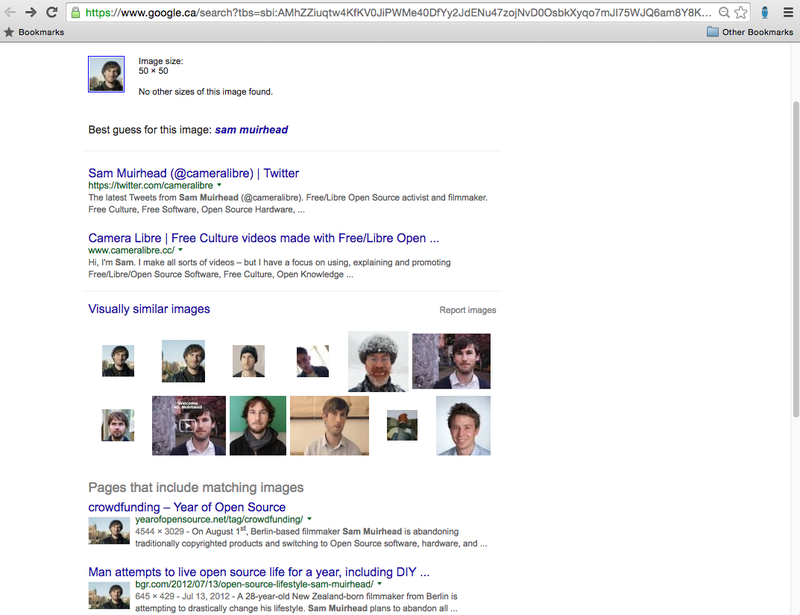 This will reverse search Google for that exact image. Lo and behold, this turns out to be Sam Muirhead, a filmmaker. Ok. We can stop there. 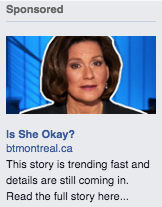 Clearly someone has figured out how to game the Facebook system in order to run ads that look like they lead one place (ctvnews.ca) and ultimately lead to somewhere vastly different. Not only that but they are repeatedly using trademarked names, terms, and false information to sell product. This violates a number of Facebook advertising policies. My guess is that you sign up for the “Free Trial” and you are going to get dinged once a month for life. Or worse. 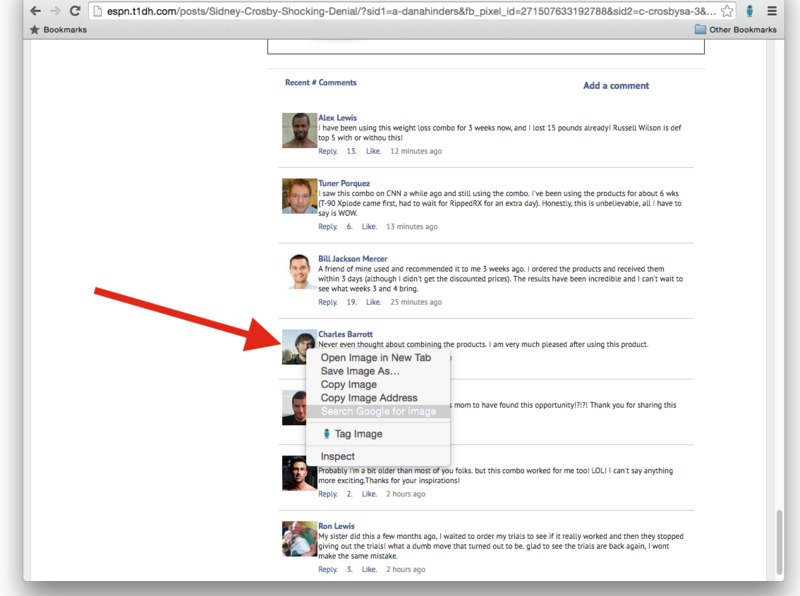 Will do a fulltext search for all facebook.com URLs that contain the keyword “sponsored” in it. This brought up a pile of hits (I have about 5k pages in my index), as you would expect since most Facebook pages contain sponsored ads. I started hunting around various archived pages and found a page that I had viewed on an investigation on December 11, 2015, roughly 6 months ago. 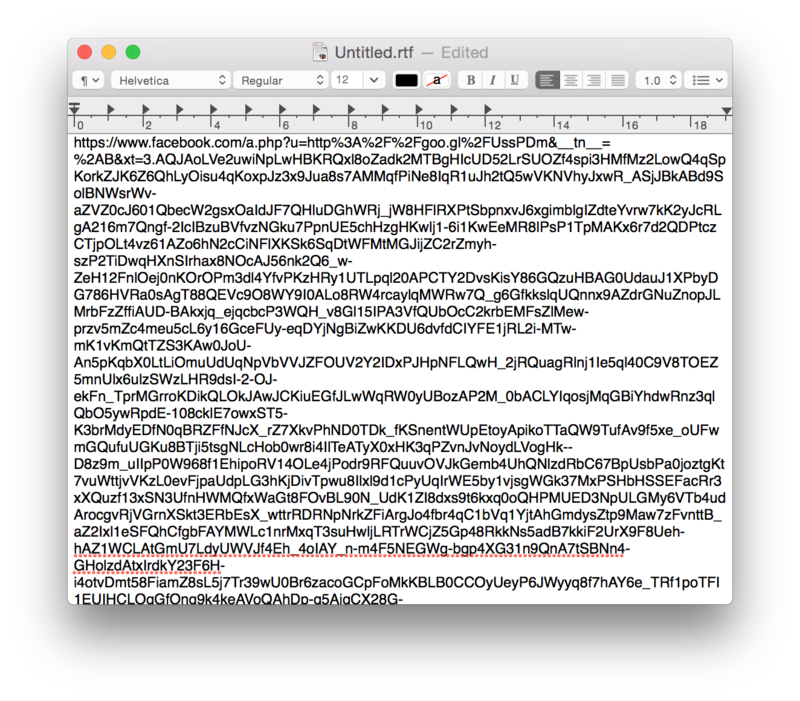 Hunchly page record that shows a Facebook URL from December 11, 2015. I viewed the page in Hunchly and saw an ad that looked suspicious just based on the ad copy. The displayed domain is for btmontreal.ca, which is a legitimate news site. I started to smell smoke. Since Hunchly has a live copy of the entire page, all of the links are preserved. I mouse over the ad to see where the click will actually land me and I see the URL displayed in the bottom of Chrome does not correspond to btmontreal.ca. We have another hit. Now I see fire. Rather than click on the link, I right-click and copy it into a text editor. 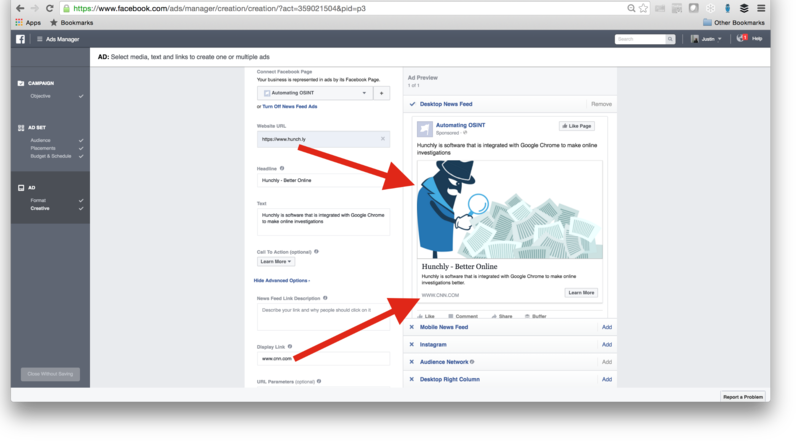 The first bit is the Facebook advertising handler, and the part in bold is the destination URL of where you land after you click. I have cut it off at the first “&” so that we just have the shortened Google URL. This leads us to the next part of our investigation. The Google URL shortener works like any other shortening service like bit.ly. You pop in a big URL and it spits out a little URL. 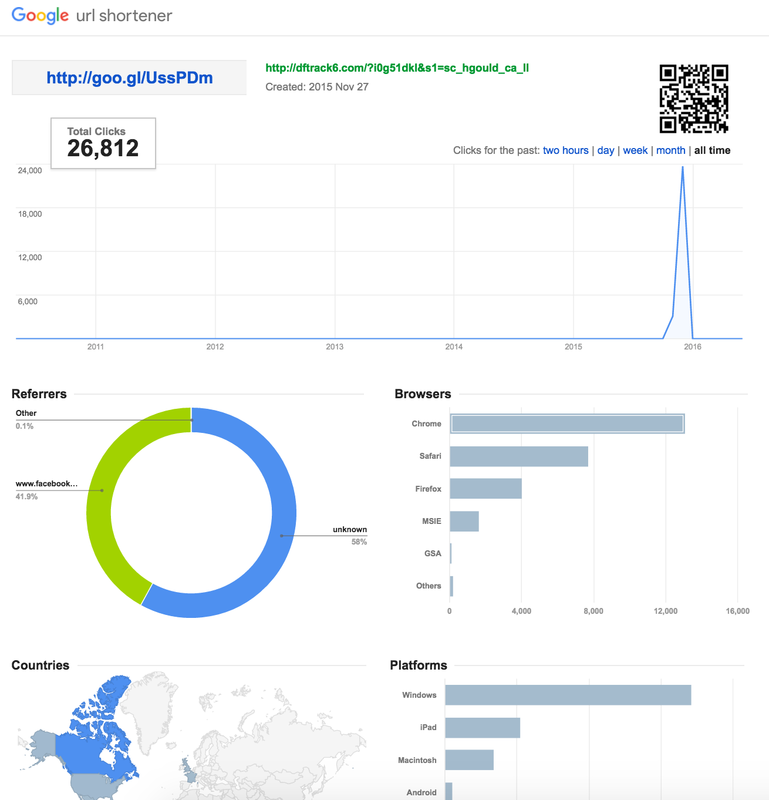 The cool thing with the Google URL shortener is that they provide analytics for you so that you can see how a shortened URL was accessed and how many times. So how do you find these wondrous analytics? Look at all that glorious data! So we can see that there were 26, 812 clicks through this shortened URL and if you hover over the doughnut chart you’ll see that there were a confirmed 11,246 of them from Facebook. That is a lot of clicks. The “Unknown” clicks could be a case of browsers not passing along the Referer HTTP header but I can’t confirm that. What we can see from the activity graph is that the campaign only ran for a relatively short period of time before stopping. In Facebook’s defence, this may have meant that they detected this fraud or someone reported the ads. It could also mean that the fraudster made enough money and decided to bail on the campaign and tear down all of their infrastructure. Tough to confirm either way. There were no cached copies of the site, and since I didn’t click on the links when I was first viewing it back in December I did not have a copy of the landing page stored in my Hunchly index. So we do not have enough proof to show that we have a fraudulent landing page, but if you dig into the dftrack6.com domain, you will quickly see that it looks suspicious. The main point here however has been proven: fraudsters can create ads that appear to point to legitimate sites, and then drive tens of thousands of clicks through to their landing pages. Facebook apparently is asleep at the wheel, and sadly, I feel that the general Facebook user and consumers as a whole are being victimized because of it. Now it was time for me to put this all to a test. I will use local advertising and target, well, only me. I used my postal code, age, and set it so that the ads would only run for people connected to both my AutomatingOSINT.com page and the Hunchly Facebook page. For a minute I would like you to think about the capability to do this targeting from a spear phishing perspective. Scary isn’t it? Clearly we are beginning to see the problem. Now of course this is really an insane thing from an advertising network perspective. If you tried this in Google AdWords, you would be laughed right out of your account. There are no other indicators in the ad that tell the user they are destined for www.hunch.ly. Any normal user will simply see www.cnn.com and think that they are heading to a trusted domain. 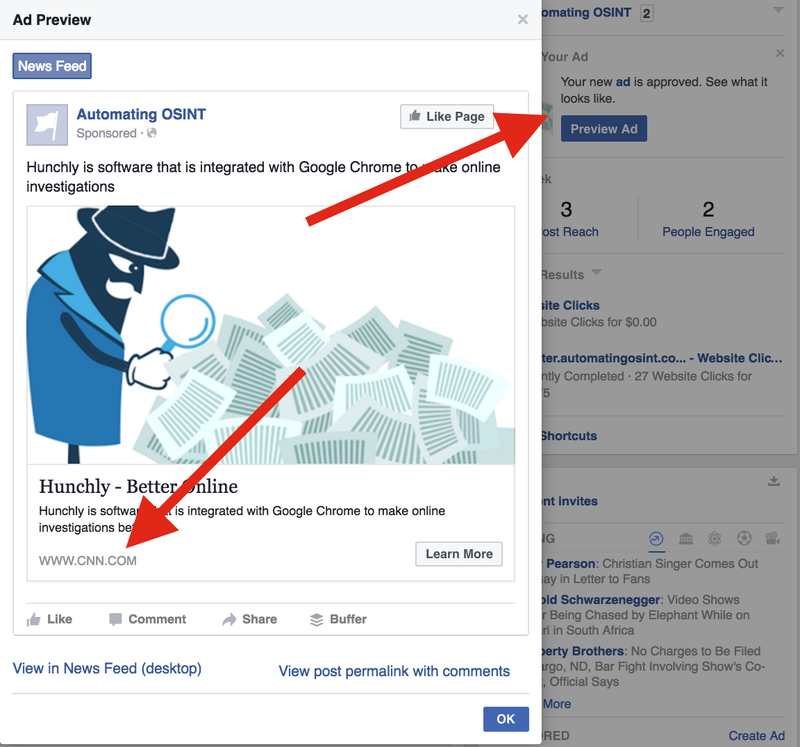 How many Facebook users are actually checking the bottom of their browser window every time they hover over a link? Not many. This is all fine and dandy, but of course I need to get the ad through by Facebook’s approval process. Surely they must catch the fact that the destination URL is not even close to the displayed URL. Surely they must see how bad this would be for the average consumer or Facebook user. Will our ad make the cut? Once the ad started running, I turned it off right away. I am sure if someone from Facebook is reading this article and has made it this far, my advertising account will promptly be suspended. In the security world we have long been pushing to make sure that products become more “secure by default”. This means that no matter how little a user knows, they are protected as best as possible from day one. While we are all aware that there are ways to commit fraud through advertising networks, in a lot of cases it requires numerous tricks or a relatively high level of sophistication. Google AdWords is extremely vigilant when it comes to placing a new ad (go try it) to make sure that you are not doing anything suspicious. While AdWords is not a perfect system, like anything in security the idea is to raise the bar high enough that only the most sophisticated fraudsters can game the system. Now what I would love for you to do is to check your own Facebook account for sponsored ads. Do they point to the domain that they say they do? If not email me your findings, I would love to start collecting some statistics or to see some spinoff investigations to see how widespread this problem truly is. And of course, if you are going to go do an online investigation, you should really check out Hunchly.